ORGINAL PART NUMBER: 826001. VAUXHALL OPEL ASTRA INSIGNIA ZAFIRA. THERMOSTAT HOSE PIPE. We have many years experience in the automotive components and fasteners industry. Check Compatibility for clearer information. 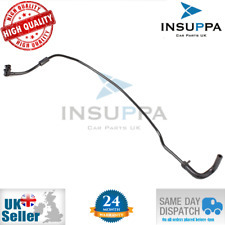 VAUXHALL/OPEL THERMOSTAT HOSE. 24 MONTHS WARRANTY ! Lancia Delta. Isuzu Gemini. 16mm HEATER HOSE Sold by the meterMax Length - 20m Rubber Heater / Coolant Hose 16mm (5/8") internal 23 mm outer diameter Designed for heater hose applications where resistance to antifreeze coolants and under hood temperatures are required. Temperature Range: -40°C to 120°C Pressure Rating: 145 PSI - 10 BAR Reinforcement: Synthetic Textile Standard: SAEJ20R3 Safety Factor: 3:1 Bend Radius 160mm Lining: Black EPDM Rubber Cover: Ozone, heat and weather resistant EPDM Rubber Please make sure before ordering you measure the INTERNAL diameter of your hose. FAST DISPATCH PLEASE NOTE Important notice BEFORE ordering Please DO NOT rely on the compatibility list to make your decision of parts, as cars come with many variations and fitments on the same . 16mm RIGHT ANGLED HEATER HOSE Rubber Heater / Coolant Black with 200mm legs Hose 16mm (5/8") internal Designed for heater hose applications where resistance to antifreeze coolants and under hood temperatures are required. Can be cut to fit. Temperature Range: -30°C to 110°C Reinforcement: Polyester Standard: DIN 73411 Please make sure before ordering you measure the INTERNAL diameter of your hose. FAST DISPATCH PLEASE NOTE Important notice BEFORE ordering Please DO NOT rely on the compatibility list to make your decision of parts, as cars come with many variations and fitments on the same make and models. Check things like dimensions size and other stated fitment criteria prior to ordering to make sure you get the correct part as vehicle parts can have. 1 Meter 19mm HEATER HOSE Repair Kit Sold as a meter Rubber Heater / Coolant Hose 19mm (3/4") internal 28 mm outer diameter Designed for heater hose applications where resistance to antifreeze coolants and under hood temperatures are required. Temperature Range: -40°C to 120°C Pressure Rating: 145 PSI - 10 BAR Reinforcement: Synthetic Textile Standard: SAEJ20R3 Safety Factor: 3:1 Bend Radius 190mm Lining: Black EPDM Rubber Cover: Ozone, heat and weather resistant EPDM Rubber Please make sure before ordering you measure the INTERNAL diameter of your hose. 4 Clips that fit this hose will be provided This pack also includes Two straight connector suitable for internal diameter tube. Straight Connector : Product Information Temperature: -30 140 . 19mm RIGHT ANGLED HEATER HOSE Rubber Heater / Coolant Black with 200mm legs Hose 19mm (3/4") internal Designed for heater hose applications where resistance to antifreeze coolants and under hood temperatures are required. Can be cut to fit. Temperature Range: -30°C to 110°C Reinforcement: Polyester Standard: DIN 73411 Please make sure before ordering you measure the INTERNAL diameter of your hose. FAST DISPATCH PLEASE NOTE Important notice BEFORE ordering Please DO NOT rely on the compatibility list to make your decision of parts, as cars come with many variations and fitments on the same make and models. Check things like dimensions size and other stated fitment criteria prior to ordering to make sure you get the correct part as vehicle parts can have. ONE WAY NON RETURN T PIECE VALVE Non Return Inline T Piece Valve - One way Center is the input and both sides output Will fit tubes 5mm and 6mm Design to stop the back flow of air and water passing back down the pipes or tubes. FAST DISPATCH PLEASE NOTE Important notice BEFORE ordering Please DO NOT rely on the compatibility list to make your decision of parts, as cars come with many variations and fitments on the same make and models. Check things like dimensions size and other stated fitment criteria prior to ordering to make sure you get the correct part as vehicle parts can have more than one option due to changes on chassis / engine number or modification. We cannot be held responsible for wrong parts ordered if you have not carried out the above. If you . ORGINAL PART NUMBER: 826001. VAUXHALL OPEL ASTRA INSIGNIA ZAFIRA. 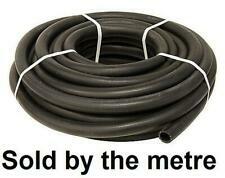 THERMOSTAT HOSE PIPE. THIS PART SUITABLE FOR 3 YEAR WARRANTY. ORGINAL PART NUMBER: 826001. VAUXHALL OPEL ASTRA INSIGNIA ZAFIRA. 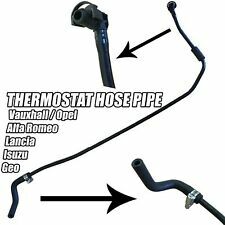 THERMOSTAT HOSE PIPE. - Ending Soon. - New Arrivals. - Add to Favorites. Quick Links. 19mm HEATER HOSE Sold by the meterMax Length - 20m Rubber Heater / Coolant Hose 19mm (3/4") internal 28mm outer diameter Designed for heater hose applications where resistance to antifreeze coolants and under hood temperatures are required. Temperature Range: -40°C to 120°C Pressure Rating: 145 PSI - 10 BAR Reinforcement: Synthetic Textile Standard: SAEJ20R3 Safety Factor: 3:1 Bend Radius 190mm Lining: Black EPDM Rubber Cover: Ozone, heat and weather resistant EPDM Rubber Please make sure before ordering you measure the INTERNAL diameter of your hose. FAST DISPATCH PLEASE NOTE Important notice BEFORE ordering Please DO NOT rely on the compatibility list to make your decision of parts, as cars come with many variations and fitments on the same . 13mm RIGHT ANGLED HEATER HOSE Rubber Heater / Coolant Black with 200mm legs Hose 13mm (1/2") internal Designed for heater hose applications where resistance to antifreeze coolants and under hood temperatures are required. Can be cut to fit. Temperature Range: -30°C to 110°C Reinforcement: Polyester Standard: DIN 73411 Please make sure before ordering you measure the INTERNAL diameter of your hose. FAST DISPATCH PLEASE NOTE Important notice BEFORE ordering Please DO NOT rely on the compatibility list to make your decision of parts, as cars come with many variations and fitments on the same make and models. Check things like dimensions size and other stated fitment criteria prior to ordering to make sure you get the correct part as vehicle parts can have. (57 is an easy slide on, 60 is tight fit, needs a wiggle). ONE WAY NON RETURN STRAIGHT PIECE VALVE Non Return Inline Straight Piece Valve - One way Center is the input and both sides output Will fit tubes 5mm and 6mm Design to stop the back flow of air and water passing back down the pipes or tubes. FAST DISPATCH PLEASE NOTE Important notice BEFORE ordering Please DO NOT rely on the compatibility list to make your decision of parts, as cars come with many variations and fitments on the same make and models. Check things like dimensions size and other stated fitment criteria prior to ordering to make sure you get the correct part as vehicle parts can have more than one option due to changes on chassis / engine number or modification. We cannot be held responsible for wrong parts ordered if you have not carried out the above. If. 10mm HEATER HOSE Sold by the meterMax Length - 10m Rubber Heater / Coolant Hose 10mm (3/8") internal 17 mm outer diameter Designed for heater hose applications where resistance to antifreeze coolants and under hood temperatures are required. Temperature Range: -40°C to 120°C Pressure Rating: 145 PSI - 10 BAR Reinforcement: Synthetic Textile Standard: SAEJ20R3 Safety Factor: 3:1 Bend Radius 100mm Lining: Black EPDM Rubber Cover: Ozone, heat and weather resistant EPDM Rubber Please make sure before ordering you measure the INTERNAL diameter of your hose. FAST DISPATCH PLEASE NOTE Important notice BEFORE ordering Please DO NOT rely on the compatibility list to make your decision of parts, as cars come with many variations and fitments on the same make and . GATES CURVED RADIATOR HOSE. The Gates Reels Can Be Broken Down To Length On Request. The hoses are designed for radiator applications at continuous temperatures from -40°C to 100°C. Occasional temperatures as high as 110°C are allowed. 13mm HEATER HOSE Sold by the meterMax Length - 20m Rubber Heater / Coolant Hose 13mm (1/2") internal 20mm outer diameter Designed for heater hose applications where resistance to antifreeze coolants and under hood temperatures are required. Temperature Range: -40°C to 120°C Pressure Rating: 145 PSI - 10 BAR Reinforcement: Synthetic Textile Standard: SAEJ20R3 Safety Factor: 3:1 Bend Radius 130mm Lining: Black EPDM Rubber Cover: Ozone, heat and weather resistant EPDM Rubber Please make sure before ordering you measure the INTERNAL diameter of your hose. FAST DISPATCH PLEASE NOTE Important notice BEFORE ordering Please DO NOT rely on the compatibility list to make your decision of parts, as cars come with many variations and fitments on the same . 1 Meter 10mm HEATER HOSE Repair Kit Sold as a meter Rubber Heater / Coolant Hose 10mm (3/8") internal 17 mm outer diameter Designed for heater hose applications where resistance to antifreeze coolants and under hood temperatures are required. Temperature Range: -40°C to 120°C Pressure Rating: 145 PSI - 10 BAR Reinforcement: Synthetic Textile Standard: SAEJ20R3 Safety Factor: 3:1 Bend Radius 100mm Lining: Black EPDM Rubber Cover: Ozone, heat and weather resistant EPDM Rubber Please make sure before ordering you measure the INTERNAL diameter of your hose. 4 Clips that fit this hose will be provided This pack also includes Two straight connector suitable for 10mm internal diameter tube. Straight Connector : Product Information Temperature: -30 140 . 32mm 1.1/4" RIGHT ANGLED HEATER HOSE Rubber Heater / Coolant Black with 200mm legs Hose 32mm (1.1/4") internal Designed for heater hose applications where resistance to antifreeze coolants and under hood temperatures are required. Can be cut to fit. Temperature Range: -30°C to 110°C Reinforcement: Polyester Standard: DIN 73411 Please make sure before ordering you measure the INTERNAL diameter of your hose. FAST DISPATCH PLEASE NOTE Important notice BEFORE ordering Please DO NOT rely on the compatibility list to make your decision of parts, as cars come with many variations and fitments on the same make and models. Check things like dimensions size and other stated fitment criteria prior to ordering to make sure you get the correct part as vehicle parts can. 10mm HEATER HOSE CLIPS Sold by the meterMax Length - 10m Rubber Heater / Coolant Hose 10mm (3/8") internal 17 mm outer diameter Designed for heater hose applications where resistance to antifreeze coolants and under hood temperatures are required. Temperature Range: -40°C to 120°C Pressure Rating: 145 PSI - 10 BAR Reinforcement: Synthetic Textile Standard: SAEJ20R3 Safety Factor: 3:1 Bend Radius 100mm Lining: Black EPDM Rubber Cover: Ozone, heat and weather resistant EPDM Rubber Please make sure before ordering you measure the INTERNAL diameter of your hose. 2 Clips that fit this hose will be provided FAST DISPATCH PLEASE NOTE Important notice BEFORE ordering Please DO NOT rely on the compatibility list to make your decision of parts, as cars come with. 19mm RIGHT ANGLED HEATER HOSE Rubber Heater / Coolant Black Rapped with 200mm legs Hose 19mm (3/4") internal Designed for heater hose applications where resistance to antifreeze coolants and under hood temperatures are required. Can be cut to fit. Temperature Range: -30°C to 110°C Reinforcement: Polyester Standard: DIN 73411 Please make sure before ordering you measure the INTERNAL diameter of your hose. FAST DISPATCH PLEASE NOTE Important notice BEFORE ordering Please DO NOT rely on the compatibility list to make your decision of parts, as cars come with many variations and fitments on the same make and models. Check things like dimensions size and other stated fitment criteria prior to ordering to make sure you get the correct part as vehicle parts can have. 13mm HEATER HOSE CLIPS Sold by the meterMax Length - 20m Rubber Heater / Coolant Hose 13mm (1/2") internal 20mm outer diameter Designed for heater hose applications where resistance to antifreeze coolants and under hood temperatures are required. Temperature Range: -40°C to 120°C Pressure Rating: 145 PSI - 10 BAR Reinforcement: Synthetic Textile Standard: SAEJ20R3 Safety Factor: 3:1 Bend Radius 130mm Lining: Black EPDM Rubber Cover: Ozone, heat and weather resistant EPDM Rubber Please make sure before ordering you measure the INTERNAL diameter of your hose. 2 Clips that fit this hose will be provided FAST DISPATCH PLEASE NOTE Important notice BEFORE ordering Please DO NOT rely on the compatibility list to make your decision of parts, as cars come with many. Part Number: 3729. Radiator Hose. Replaces following reference(s) (We can mark the item as a 'gift' if requested to, but we will not declare any different amount). Toys & Gifts. Janitorial & Hygiene. 16mm HEATER HOSE CLIPS Sold by the meterMax Length - 20m Rubber Heater / Coolant Hose 16mm (5/8") internal 23 mm outer diameter Designed for heater hose applications where resistance to antifreeze coolants and under hood temperatures are required. Temperature Range: -40°C to 120°C Pressure Rating: 145 PSI - 10 BAR Reinforcement: Synthetic Textile Standard: SAEJ20R3 Safety Factor: 3:1 Bend Radius 160mm Lining: Black EPDM Rubber Cover: Ozone, heat and weather resistant EPDM Rubber Please make sure before ordering you measure the INTERNAL diameter of your hose. 2 Clips that fit this hose will be provided FAST DISPATCH PLEASE NOTE Important notice BEFORE ordering Please DO NOT rely on the compatibility list to make your decision of parts, as cars come with many. 1 Meter 16mm HEATER HOSE Repair Kit Sold as a meter Rubber Heater / Coolant Hose 16mm (5/8") internal 23 mm outer diameter Designed for heater hose applications where resistance to antifreeze coolants and under hood temperatures are required. Temperature Range: -40°C to 120°C Pressure Rating: 145 PSI - 10 BAR Reinforcement: Synthetic Textile Standard: SAEJ20R3 Safety Factor: 3:1 Bend Radius 160mm Lining: Black EPDM Rubber Cover: Ozone, heat and weather resistant EPDM Rubber Please make sure before ordering you measure the INTERNAL diameter of your hose. 4 Clips that fit this hose will be provided This pack also includes Two straight connector suitable for 10mm internal diameter tube. Straight Connector : Product Information Temperature: -30 140 . 1 Meter 13mm HEATER HOSE Repair Kit Sold as a meter Rubber Heater / Coolant Hose 13mm (1/2") internal 20 mm outer diameter Designed for heater hose applications where resistance to antifreeze coolants and under hood temperatures are required. Temperature Range: -40°C to 120°C Pressure Rating: 145 PSI - 10 BAR Reinforcement: Synthetic Textile Standard: SAEJ20R3 Safety Factor: 3:1 Bend Radius 100mm Lining: Black EPDM Rubber Cover: Ozone, heat and weather resistant EPDM Rubber Please make sure before ordering you measure the INTERNAL diameter of your hose. 4 Clips that fit this hose will be provided This pack also includes Two straight connector suitable for 10mm internal diameter tube. Straight Connector : Product Information Temperature: -30 140 . Original 60556202. MPN 60556202. Codice ricambio originale OE/OEM 60556202. HOSE RADIATOR. RADIATOR HOSE. Product code: (E060) (7636A) (18402) Æ. Nicole Gao, Unicredit Bank. IBAN: IT80Y0200884330000300233397. SLEEVE SUCTION PIPE MANIFOLD FIAT CROMA-ALFA 164 FOR 60513179. Codice ricambio originale OE/OEM 60513179, 60807861. FIAT CROMA. SLEEVE MANIFOLD INLET DUCT. FOR LANCIA THEMA. Experience and professionalism at your service for over 50 years. Codice ricambio originale OE/OEM 60809325. FOR LANCIA DEDRA-DELTA. Original Fiat 60809325-7593709. FOR FIAT TEMPRA-TYPE. FLEXIBLE SLEEVE. Experience and professionalism at your service for over 50 years. Material: stainless steel aluminum alloy. Color: Silver. Quantity: a set (as shown). 5M Silicone Vacuum Tube Hose, as shown in the picture. Application: Universal. Color: Blue. We will reply you within 24- 48 hours. A pplication : Universal Application for Connecting Turbo Piping or Intake Piping. 1 Silicone Elbow Hose, as shown in the picture. Thickness: 4.5mm, 3 ply. High quality silicone hose kit. Color : Blue. Brand autobahn88 Manufacturer Part Number ASHU06-Kit-BK-alfa-austin Vacuum Hose Included 3mm - 3meter/10', 4mm - 2meter/6', 8mm-1meter/3' Others Included Zip Tie 30pcs , Spring Clamp Kit , Plastic T-Joiner 3pcs Color BLACK QTY 1 Pack as described - BEST BUY in Town Application Boost Hose, Radiator Tank,Gauge Vacuum Hose etc Materials Silicone for Automotive application UPC Does not apply Note Random Zip Tie Color (BLACK, RED, GREEN) will be arranged. Fit for air hose tube, water pipe, fuel pipe, silicone vacuum hose, etc. - Fit for hose air hose, water pipe, fuel line, silicone hose, etc. 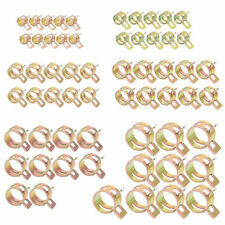 Sizes Spring Clip Distinctions Material: 65MN Spring Steel. A pplication : Universal Application for Connecting Turbo Piping or Intake Piping. 1 Silicone Elbow Hose, as shown in the picture. High quality silicone hose kit. Color : Blue. We will reply you within 24- 48 hours. 5M Silicone Vacuum Tube Hose, as shown in the picture. Color: Blue. We will reply you within 24- 48 hours. This is a CNC machined aluminum adapter designed to mount inline into a 1.5" ID radiator hose. This adapter allows you to put a temperature sensor with 3/8 NPT threads in your radiator hose. Aluminum Black Inline Radiator Hose Temperature Sensor Adapter 3/8 NPT. Flexible hose Connection From the original Fiat 7746477 rigid pipe thermostat for Fiat Coupe-type < span class = notranslate ' > 2.0 16v for Alfa Romeo 155 for Lancia Dedra-Delta < span class = notranslate ' > 2.0 16v Water pump version 1 Side inner diameter [mm] 14 1 Side outer diameter [mm] 22 inner diameter 2 [mm] Same Side 2 Side outside diameter [mm] Same length [Mm] 130 Cooling Sleeve Z086 < span class = notranslate ' > $ ... Click below for full description. Fit for air hose tube, water pipe, fuel pipe, silicone vacuum hose, etc. Material: 65 Mn Spring Steel. Due to the difference between different monitors, the picture may not reflect the actual color of the item. SUCTION HOSE PIRELLI 3269 FIAT TIPO-LANCIA DELTA FOR 7587289. Codice ricambio originale OE/OEM 7587289, 82468579. Pirelli 3269. Product code: (D687) (3269) ®. FOR LANCIA DEDRA-DELTA. FOR FIAT TEMPRA-TYPE. Brand autobahn88 Manufacturer Part Number ASHU06-Kit-RD-alfa-austin Vacuum Hose Included 3mm - 3meter/10', 4mm - 2meter/6', 8mm-1meter/3' Others Included Zip Tie 30pcs , Spring Clamp Kit , Plastic T-Joiner 3pcs Color RED QTY 1 Pack as described - BEST BUY in Town Application Boost Hose, Radiator Tank,Gauge Vacuum Hose etc Materials Silicone for Automotive application UPC Does not apply Note Random Zip Tie Color (BLACK, RED, GREEN) will be arranged. Manufacturer Part Number ASHU06-Kit-OR-alfa-austin Vacuum Hose Included 3mm - 3meter/10', 4mm - 2meter/6', 8mm-1meter/3' Others Included Zip Tie 30pcs , Spring Clamp Kit , Plastic T-Joiner 3pcs Color ORANGE QTY 1 Pack as described - BEST BUY in Town Application Boost Hose, Radiator Tank,Gauge Vacuum Hose etc Materials Silicone for Automotive application UPC Does not apply Note Random Zip Tie Color (BLACK, RED, GREEN) will be arranged Brand Unbranded. Fit for air hose tube, water pipe, fuel pipe, silicone vacuum hose, etc. - Fit for hose air hose, water pipe, fuel line, silicone hose, etc. Material: 65MN Spring Steel. - Material: high quality spring steel 65Mn.